While much has been written about his father, Sam, a titan of industry, there is no public record of Charles Bronfman’s thoughts on his own life, family, career and his significant accomplishments in sport and philanthropy. Distilled does just that, chronicling key events in the life of the heir to one of Canada’s great fortunes. Born in 1931 to the fabulously wealthy Bronfmans, Charles grew up in a 20-room mansion with many staff. Via their control of the distilling giant Seagram, the Bronfman family dominated the liquor business with brands such as Crown Royal, V.O., and Chivas Regal. By the 1980s, Seagram was also the biggest shareholder of DuPont and by the 1990s, the family’s wealth was in the billions, culminating in the $35-billion sale of Seagram to France’s Vivendi, which turned into a financial and family disaster. 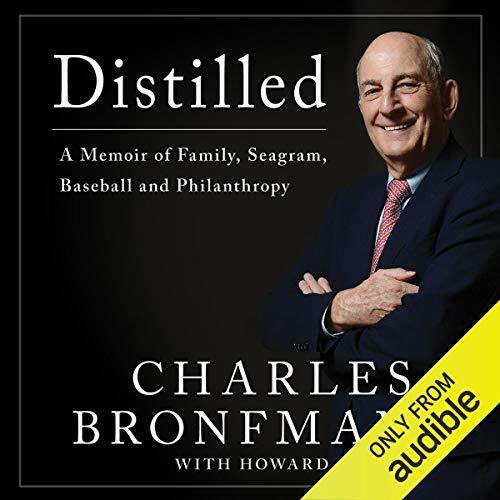 In Distilled, Charles reflects on all of it - his relationship with his parents, his brother Edgar, working in the family business, landing Canada’s first big league baseball franchise (the Montreal Expos), leading a philanthropic life by promoting Canadian identity through Heritage Minutes and supporting Israel through countless innovative initiatives including the globally respected Birthright Israel - and to how the Bronfman family splintered over the sale of Seagram. ©2016 Charles Bronfman (P)2018 Audible, Inc.